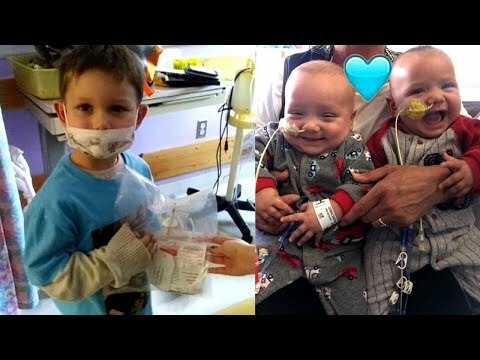 Superhero brother donates bone marrow to baby. It was barely sunrise and Michael DeMasi jnr was romping through the corridors at a children’s hospital in Philadelphia, balancing on a red line that was etched into the floor design and telling his mother to tie a balloon to him so he could “fly”. Michael’s little brothers – Santino (“Sonny”) and Giovanni (“Gio”) – needed a bone-marrow transplant, and when his parents told him that he was a donor match, Michael told them that he wanted to save his brothers and would give them some of his. “Hey, Michael,” his mother, Robin Pownall, called out as she filmed her young son early one Thursday morning in March, running ahead of her through Children’s Hospital of Philadelphia (CHOP). The boy knew what was about to happen, his mother said – a long needle would be pushed into the bone near his hip to extract the marrow, then the cells would be transplanted into his brothers. Pownall said her son told her he wanted to “help save my baby brothers”. But Pownall said the decision was not simple – she and her fiance grappled with the option, wondering whether Michael understood what was being asked of him and whether it was right to ask him at all. “Part of me was like, ‘Well, he’s four. Maybe he doesn’t know what’s going on.’ But he did, and he was all for it,” she said. Art Caplan, a professor of bioethics and head of the division of medical ethics at the New York University School of Medicine, said situations in which children were the donors did present ethical questions, namely whether a child can truly understand the risks and grant their permission – a principle known as informed consent. In addition, Caplan said, there might be risks to the donor – pain or other complications, and in instances in which the transplant is not successful, the donor may have to do it again or may begin to blame himself if the donation does not help or the recipient experiences a serious problem. But in general, “I’m inclined to allow it to happen,” he said, assuming that those involved understood and accepted the risks. It’s unclear whether CHOP had an ethics committee review Michael’s case. A hospital spokeswoman said she could not comment on Michael’s case and, when asked whether CHOP required an ethics committee to weigh in on situations involving child donors, she said that she could not confirm that either. His mother had told him that he was going to be “a real-life superhero”, and the small boy who loves Captain America as well as Spider-Man, Batman and Superman seemed excited to join their ranks. Then Pownall was taken to a waiting room, where she said she sat anxiously, thinking about her son. “I thought it was going to be harder on him than it was,” she said. “Michael did his procedure this morning for them to take the bone marrow cells,” the post read.